Linda Huff and Danny Thompson of H&H Homes celebrates the company's 5,000th home buyers, the Ellenburg family, with $10,000 in Ashley Furniture. To celebrate its 5,000th new home closed and 25th anniversary, H&H Homes gave away $10,000 in new furniture to a recent home buyer. Chase and Lauren Ellenburg were presented with $10,000 from Ashley furniture at an H&H Homes celebration June 20th at the The Highlands at Bedford Community in Raeford, NC. More than 20 recent homebuyers were at the event to find out who won the 5,000th homeowner prize. 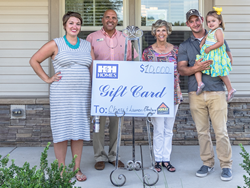 This spring, the Fayetteville-based new home builder celebrated their anniversary by giving away $200 a day for 25 days to everyday heroes. The contest asked people in communities across North and South Carolina to nominate an everyday hero—someone who unselfishly gives to the people around them, making a positive impact in the community. As evidenced by their sales and numerous home-building awards, H&H has been the builder of choice for families throughout Fayetteville, NC for the last 25 years. When the home building market rebounded, H&H expanded its reach to other markets across the Carolinas. Thanks to a successful strategy of providing quality-built, affordable homes to families the company closed on its 5000th home earlier this year. H&H Homes builds homes throughout Fayetteville, Raleigh, Wilmington and Charlotte, North Carolina and Charleston and Myrtle Beach, South Carolina. For more information, please visit HHhomes.com/5000. For 25 years, H&H Homes has been providing homebuyers with energy-efficient, quality-built and affordably priced new homes. With more than 70 communities in North and South Carolina, H&H Homes is recognized as a Builder Magazine Top-100 homebuilder and is also the recipient of numerous local and regional awards including the NC Home Builder’s Association Stars Award for Best Website; the Pillar of the Industry Award from the Fayetteville Home Builder’s Association and Builder of the Year for 2015. For more information on H&H Homes, visit http://www.HHhomes.com.